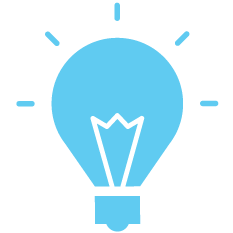 Some may not know this, but in our search for start-ups across Europe and Israel to launch on our venture platform, we have set up a base in Barcelona to try and untap the potential in the blossoming Spanish start-up ecosystem. As we’ve been tracking the early-stage tech start-ups and fundraising rounds coming out of Spain as part of our day-to-day, we thought this information could be useful to others who are also looking closely at Spanish tech and VC. We love to share our insights with our community, especially when we’re able to add our pan-European perspective thanks to our bases in Paris, Barcelona, London and Tel Aviv. So, here is our brief on everything* that happened in the Spanish start-up ecosystem in September. Let’s jump in. *Well, not quite everything… we’ve intentionally excluded biotech deals from our tracking. This is for two reasons: 1) The deals are enormous, and we believe they warp the rest of the data. 2) Investing in biotech is a different game, and biotech investors tend to only invest in biotech, because of the very specific nature of the technological know-how involved with making these kinds of investments. In short – we believe biotech funds and normal VC funds are too different to compare, so we’ve left them out this time! Barcelona was the most active city/region for deal activity in September with 9 deals, followed by Madrid with 5. The strength of the Barcelonian and Madrilenian ecosystems is prevalent here, with a clear weighting towards Barcelona last month. We’ll be watching the developments here to see if Barcelona starts to exert a dominance over Madrid. The number of Seed deals is important here. 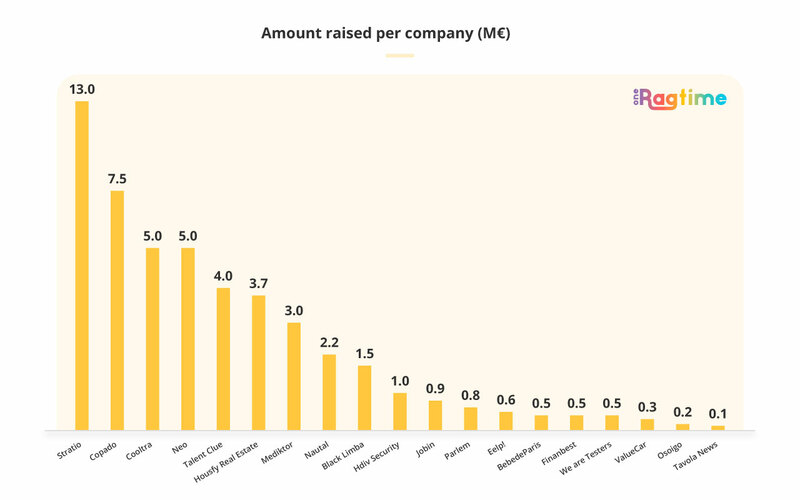 While Seed rounds were the most common funding stage, they represented a much lower proportion of the total money raised with an average of €984k per round (if we exclude Neo’s important Seed round of €5M of, the average is closer to €600k). 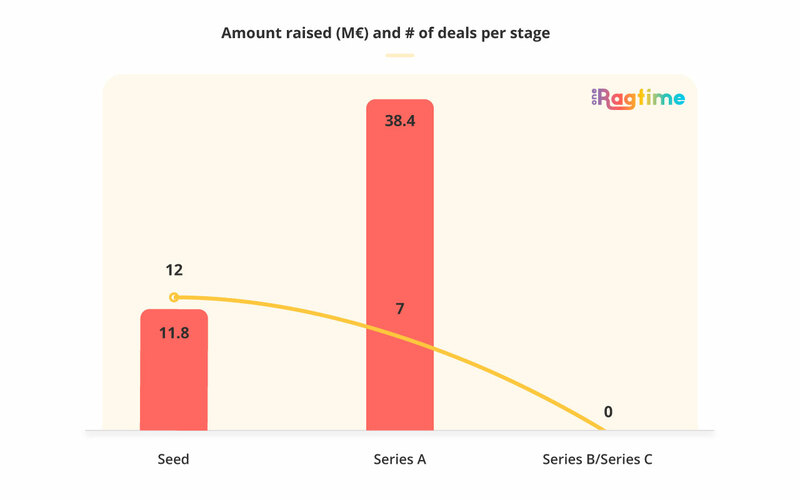 Equally significant is the number of Series A, where less deals (7 deals to Seed rounds’ 12) meant €38.4M in funding. The average ticket came at a much more elevated €5.5M. What’s this suggesting? That Spanish start-ups raise smaller Seed rounds compared to what we see in France, for instance, where Seed rounds are closer to the million-euro mark. However, we can see that the average Series A is a similar size to other countries in Europe. Indications that Spanish investors are focusing more on Series A rounds than on Seed perhaps? Again, we’ll be watching this closely. Here’s the distribution of the largest fundraisings. The two biggest came from Stratio, a big data start-up, and Copado, a deployment and release management solution for Salesforce. The biggest Seed round came from Neo, a cash management solution. 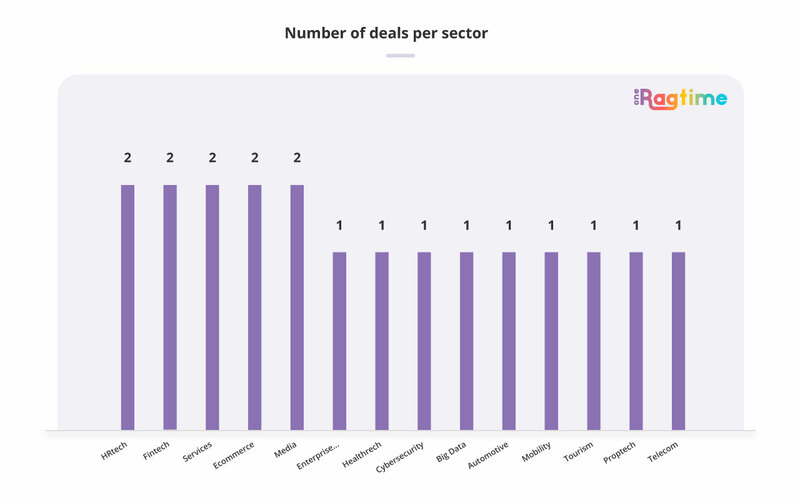 B2C deals dominate, but only when it comes to number… Consisting of a whopping 68.4% of the deals in terms of number, they only translated to 38.3% of the funds raised universally. While there are significantly fewer B2B deals, they are counting for over half of the funds raised. Why? Mainly because the dataset is driven by the 2 big Series A rounds from Stratio and Copado, who raised €13M and €7.5M respectively, whereas B2C deals were mainly in Seed rounds this month. The Spanish ecosystem boasts a broad range of industries, with no particular front-runner. Again, we’ll be watching how these industries develop on a quarterly and annual basis to look for trends, but in September, there is nothing really to report on the sector distribution.